In this collection we have gathered 6 background images of vintage tv sets in different environments. Great to showcase your videos or images on a tv screen. Or use it as an intro or outro showing your brand. The collection was made for Camtasia 9 and will not work in earlier versions. Below you will find an overview video and overview images of included resources. 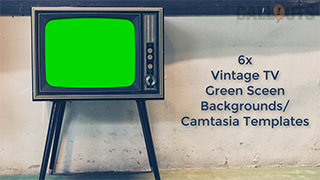 The green screens are already removed in the Camtasia templates and the tv screen as been angled to reflect the television. When adjusting your video, it is helpful to lock the TV layer so you don’t move it instead of your video. Very cool. Not sure How I’ll use it but I’m going to try! Very neat! Thanks for putting on instructions on the screen to tell us what to do!